The Kimberley is the northernmost of the nine regions of Western Australia. It is bordered on the west by the Indian Ocean, on the north by the Timor Sea, on the south by the Great Sandy and Tanami Deserts in the region of Pilbara, and on the east by the Northern Territory. The region was named after John Wodehouse, 1st Earl of Kimberley, who served as Secretary of State for the Colonies from 1870 to 1874 and 1880 to 1882. The Kimberley was one of the earliest settled parts of Australia, with the first arrivals landing about 41,000 years ago. In 1837, with support from the Royal Geographical Society, Lieutenants George Grey and Franklin Lushington, and 12 men sailed on the schooner Lynher from Cape Town, reaching Hanover Bay on 2 December 1837. The party started inland on 19 January 1838. Leaders and men were totally inexperienced, progress was delayed by flooded country, many stores were abandoned, and the party was constantly split up despite the presence of large numbers of hostile Aboriginals. On 11 February, Grey was speared and became critically ill, but after two weeks, continued the exploration. The party discovered and named the Gairdner River, the Glenelg River, the Stephen and Whately ranges and Mount Lyell before returning to Hanover Bay in April. There they were picked up by the Beagle and Lynher and taken to Mauritius to recuperate. In 1879, Alexander Forrest trekked across from the western coast to the Northern Territory. Forrest named the Kimberley district, and discovered the Margaret and Ord Rivers, the King Leopold Ranges, and the fertile area between the Fitzroy and Ord River. He subsequently set himself up as a land agent specialising in the Kimberley and was thus instrumental in the leasing of over 21,000,000 hectares (51,000,000 acres) of land in the region during 1883. In 1881, Philip Saunders and Adam Johns, in the face of great difficulties and dangers, found gold in various parts of the Kimberley. Early in 1881, the first five graziers, who called themselves the Murray Squatting Company, took up 49,000 hectares (120,000 acres) behind Beagle Bay and named it Yeeda Station. They became the first men to shear sheep in the southern Kimberley in 1883. There was further European settlement in 1885, when cattle were driven across Australia from the eastern states in search of good pasture lands. Many other Europeans arrived soon after, when gold was discovered around Halls Creek. In the 1890s, the area was the site of an armed insurrection of indigenous people under the leadership of Jandamarra, a Bunuba warrior. The only Japanese force to land in Australia during World War II was a small reconnaissance party that landed in the Kimberley on 19 January 1944 to investigate reports that the Allies were building large bases in the region. The party consisted of four Japanese officers on board a small fishing boat. It investigated the York Sound region for a day and a night before returning to Kupang in Timor on 20 January. Upon returning to Japan in February, the junior officer who commanded the party suggested using 200 Japanese prison inmates to launch a guerrilla campaign in Australia. Nothing came of this and the officer was posted to other duties. The 2011 estimated permanent population of the Kimberley was 34,794 but it rises dramatically during winter. On Census night in 2011 (9 August), it was 50,113. The population is fairly evenly distributed, with only three towns having populations in excess of 2,000: Broome (12,766), Derby (3,261) and Kununurra (4,573). Approximately 40% of the region's population is of Aboriginal descent. At federal level, the Kimberley is represented by the member for Durack. At state level, the Kimberley electorate takes in all of the region and its towns. The Kimberley region consists of the local government areas of Broome, Derby-West Kimberley, Halls Creek and Wyndham-East Kimberley. The Kimberley is an area of 423,517 square kilometres (163,521 sq mi), which is about three times the size of England, twice the size of Victoria, or just slightly smaller than California. The Kimberley consists of the ancient, steep-sided mountain ranges of northwestern Australia cut through with sandstone and limestone gorges and steep ridges, from which the extreme monsoonal climate has removed much of the soil. The southern end of the Kimberley beyond the Dampier Peninsula is flatter with dry tropical grassland and is used for cattle ranching. In parts of the Kimberley, such as the valleys of the Ord and Fitzroy Rivers in the south, the soils are relatively usable cracking clays, whilst elsewhere they are lateritic Orthents. Although none of the mountains reach even 1,000 metres (3,281 ft), there is so much steep land as to make much of the region difficult to traverse, especially during the wet season, when even sealed roads are often flooded. The coast is typically steep cliffs in the north but flatter in the south, all subject to high tides. The Kimberley has a tropical monsoon climate. The region receives about 90% of its rainfall during the short wet season, from November to April, when cyclones are common (especially around Broome) and the rivers flood. The annual rainfall is highest in the northwest, where Kalumburu and the Mitchell Plateau average 1,270 millimetres (50 in) per year, and lowest in the southeast where it is around 520 millimetres (20 in). In the dry season, from May to October, south easterly breezes bring sunny days and cool nights. Climate change since 1967 has led to large increases of as much as 250 millimetres (10 in) per year in annual rainfall over the whole region. Recent studies suggest Asian pollution and not global warming as the cause of this increased rainfall. In 1997 and 2000, the region received especially heavy rains, leading to record flooding of the Fitzroy and other rivers. The Kimberley is one of the hottest parts of Australia, with the average annual mean temperature around 27 °C (81 °F), and with mean maximum temperatures almost always above 30 °C (86 °F), even in July. The hottest part of the year is November before the rains break, when temperatures frequently reach above 37 °C (99 °F) on the coast and well over 40 °C (104 °F) inland. Mean minimum temperatures in July range from around 12 °C (54 °F) in the south to 16 °C (61 °F) along the coast, whilst in November and December they are generally around 26 °C (79 °F). Record high temperatures range from around 47 to 48 °C (117 to 118 °F), while record lows are around 2 to 3 °C (36 to 37 °F), although some parts of the central Kimberly plateau can drop below 0 °C (32 °F) during the dry season. The Aboriginal people of the Kimberley recognise six traditional seasons based on meteorological events, as well as observations of flora and fauna. During the Devonian period, a barrier reef system formed before a subsequent drop in sea levels over the Kimberley. This reef system was similar to the Great Barrier Reef and is still visible today in the form of the Napier Range and the Ningbing Range. 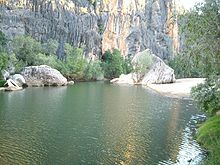 Some of the features are Tunnel Creek, Windjana Gorge and Geikie Gorge. 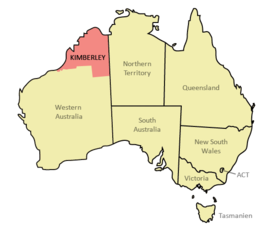 This area is also known as the Kimberley Block physiographic province, of which it is part of the larger West Australian Shield division. This province contains the King Leopold Range, Durack Range, Leveque Rise, Browse Depression, and Londonderry Rise physiographic sections. In BOM weather reports the North Kimberley Coast - is the WA Border to Kuri Bay section of the coast, while the West Kimberley Coast is from Kuri Bay to Wallal Downs. Significant sections of the coastline between Broome and Wyndham have no means of road access, and boat or helicopter are the only means. Due to the isolation a number of tourist operations on the coastline have been called wilderness locations. The rugged and varied sandstone landscape is home to a distinctive mixture of wildlife which has been thoroughly mapped and described by the Western Australian Department of Conservation and Land Management. There are similar habitats to the Kimberley across the border in the Northern Territory including the valleys of the Victoria and Daly Rivers but these have been less carefully studied. 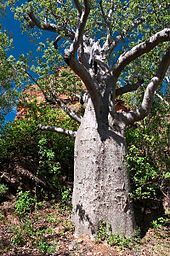 Much of the Kimberley is chiefly covered in open savanna woodland dominated by low bloodwood and boab trees (Adansonia gregorii) with Darwin stringybark and Darwin woollybutt eucalyptus in the wetter areas. 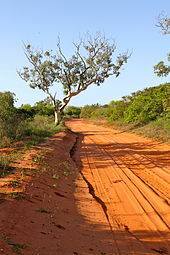 The red sandy soil of the Dampier Peninsula in the south is known for its characteristic pindan wooded grassland while in the more fertile areas like the Ord valley the trees are grasslands of Chrysopogon, Aristida, Dicanthium and Xerochloa (rice grass) in the wetter valleys. The banks of the Ord, Fitzroy and other rivers are home to a greater variety of vegetation while in sheltered gorges of the high rainfall north there are patches of tropical dry broadleaf forest, called monsoon forests, deciduous vine forest or vine thicket in Australia (often mistakenly called 'dry rainforest'), which were unknown to science until 1965 and are one of the most floristically rich parts of Australia outside the Wet Tropics and southwestern WA. There are also areas of mangrove in river estuaries where the coast is flatter. Animals found here include the huge saltwater crocodile and a rich variety of birds such as the channel-billed cuckoo, Pacific koel, purple-crowned fairywren and the bowerbird. The sandstone gorges of north Kimberley are an important refuge for a particularly rich collection of endemic species including some that have disappeared from the flatter areas including for example the purple-crowned fairywren, the endangered Gouldian finch and a large number of frogs: flat-headed frog, cave-dwelling frog, magnificent tree frog, Derby toadlet, small toadlet, fat toadlet, the unconfirmed marbled toadlet, Mjoberg's toadlet, mole toadlet and stonemason's toadlet. Mammals that have declined especially in the flatlands include the bilby, northern quoll, pale field rat, golden-backed tree-rat, and golden bandicoot. A species of endemic gecko, Gehyra kimberleyi, is named after the Kimberley region. The gorges of central Kimberley are known for their fossils and for their large colonies of bats include Windjana, Tunnel Creek, and Geikie Gorges. Lake Argyle and other wetlands of the Ord and the Kimberley are important habitats while there are important populations of shorebirds in the Ord estuary, Eighty-mile Beach and Roebuck Bay, which has been described as "one of the most important stop-over areas for shorebirds in Australia and globally". Finally there are a number of rocky islands off the north coast that are home to birds and turtles. Little of the Kimberley has been subject to wholesale clearance other than particularly fertile parts of the Ord Valley (and areas of Kimberley-type habitat across in the Daly River basin in the Northern Territory) but the pastureland in the southern areas has been affected by 100 years of livestock grazing and other threats including introduced weeds (such as cocklebur, parkinsonia, bellyache bush and castor oil plant), feral cats and changes to traditional Aboriginal fire regimes (the way grassland is burnt and allowed to renew). However the remote sandstone areas to the north have valuable original habitat in good condition providing shelter for much wildlife. The largest protected areas are the Prince Regent National Park and the Drysdale River National Park along with Gregory National Park and Keep River National Park across in the Northern Territory which preserve similar habitats, (and indeed Keep River's nearest town is Kununurra in the Kimberley). The Kimberley is a popular tourist destination, with areas such as the Bungle Bungle, the Gibb River Road, Lake Argyle, El Questro Station, Mornington Sanctuary, Horizontal Falls and Cape Leveque. The Gibb River Road and the road into the Bungle Bungles can at times be accessed in a two-wheel drive car, although one can access many additional areas in a four-wheel drive vehicle. Other parks in the region include Geikie Gorge National Park, Mirima National Park, Mitchell River National Park, Point Coulomb National Park, Purnululu National Park, Tunnel Creek National Park, Windjana Gorge National Park and Wolfe Creek Meteorite Crater National Park. In 2012 the Western Australian government announced the creation of the 7,062 square kilometre Camden Sound Marine Park with a further three more to come. Visitors to the area should be aware that the area can be subject to controlled burns at any time of year. In September 2011, a fire burned five people, two severely, who had been competing in the Kimberley Ultramarathon, an endurance cross country footrace. The Wilderness Society has led a campaign to protest a proposal to industrialise the James Price Point area of Broome. The Woodside corporation, with the additional involvement of BHP Billiton and the Australian government, has sought to build a gas industrial complex and those in opposition believe that such a development threatens the region. The campaign has received support from public figures such as John Butler, Clare Bowditch, Missy Higgins and former leader of the Australian Greens, Dr Bob Brown. On 5 October 2012, a concert was held at Federation Square in Melbourne, Australia, to raise awareness of the campaign; the protest event attracted approximately 6,000 people. On 24 February 2013, an estimated 20,000 people gathered for a charity concert in Fremantle, Western Australia to raise awareness and funds to help protect the Kimberley with performances from Ball Park Music, Missy Higgins, and John Butler. The Kimberley region has a diverse regional economy. Mining, construction, tourism, retail, agriculture, and pearling are major contributors to the region’s economic output. 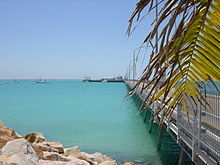 The town of Broome has a flourishing pearling industry which operates around the Kimberley coast. Some of the major farmers are Paspaley Pearls, Clipper Pearls, Broome Pearls and the Willie Creek Pearl Farm. One third of the world's annual production of diamonds is mined at the Argyle and the Ellendale diamond mines. Oil is extracted from the Blina oil field and gas is expected to be taken from offshore sources soon. Zinc and lead were mined at the Pillara and Cadjebut mines near Fitzroy Crossing with nickel still being mined at Sallay Mallay near Halls Creek. Derby is the nearest export base for shipping these metals. Traditionally, the economy depended on pastoral leases - with most of the region covered by the leases. More recently agriculture has been focused on the Ord River Irrigation Area near Kununurra. Irrigation was also trialled in the West Kimberley by way of the now defunct Camballin Irrigation Scheme. There are also fruit growers in Broome and in other areas in the West Kimberley. Beef cattle are grown in the Kimberley and exported live. Wyndham features the last remaining meatworks in the Kimberley - there were formerly works at Broome and Derby but financial constraints have caused these to be closed. Barramundi are bred in Lake Argyle; and Broome features a fully equipped Aquaculture Park near the port which is tenanted by amongst others Paspaley Pearls and Broome TAFE. The Kimberley also has a thriving fishing industry. Some of Australia's most prominent indigenous artists and art centres are in or adjacent to the Kimberley region. Artists such as Paddy Bedford and Freddie Timms have an international profile, and there are a number of Aboriginal-owned and controlled art centres and companies that assist artists, arrange exhibitions and sell works. The art centres in the region are also organised through the Association of Northern, Kimberley and Arnhem Aboriginal Artists. Issues have been raised regarding the exploitation of indigenous artists by businesses and individuals, including in the Kimberley, which were canvassed in an Australian Senate parliamentary committee report. Tourism is expected to remain one of the Kimberley region’s major growth industries. Averaged across 2010, 2011, and 2012, there were 292,600 domestic and international visitors to the Kimberley annually. ^ a b "High Census Night Ratios, Western Australia". Perspectives on Regional Australia: Comparing Census Night and Usual Resident Populations in Local Government Areas, 2011. Australian Bureau of Statistics. 16 September 2013. Archived from the original on 15 August 2014. Retrieved 12 August 2014. ^ Room, Adrian (2006). Placenames of the world: origins and meanings of the names for 6,600 countries, cities, territories, natural features, and historic sites. McFarland. p. 196. ISBN 978-0-7864-2248-7. ^ Balme, Jane (December 2000). "Excavations revealing 40,000 years of occupation at Mimbi Caves, south central Kimberley, Western Australia". Australian Archaeology (51). Archived from the original on 27 June 2013. Retrieved 27 August 2012. ^ "Arts and Sciences - Royal Geographical Society". The literary gazette and journal of belles lettres, arts, sciences, etc (1139): 731–732. 17 November 1838. ^ "Grey, Sir George (1812–1898)". Australian Dictionary of Biography. National Centre of Biography, Australian National University. Archived from the original on 18 September 2011. Retrieved 25 August 2011. ^ Pedersen, Howard; Woorunmurra, Banjo (1995). Jandamarra and the Bunuba Resistance. Broome, Western Australia: Magabala Books. ISBN 1-875641-60-2. ^ Frei (1991), pg 173–174. ^ "Kimberley - All people - usual residents". 2011 Census QuickStats. Australian Bureau of Statistics. 16 September 2013. Archived from the original on 24 September 2015. Retrieved 12 August 2014. ^ Kabay, E. D., and A. A. Burbidge. editors. 1977. A biological survey of the Drysdale River National Park, north Kimberley, Western Australia. Wildlife Research Bulletin no. 6. Department of Fisheries and Wildlife, Perth. ^ McKenzie, N.L. editor. 1981b. Mammals of the Phanerozoic South-west Kimberley, Western Australia: biogeography and recent changes. Journal of Biogeography 8: 263-280. ^ McKenzie, N.L. editor. 1983. Wildlife of the Dampier Peninsula, south-west Kimberley, Western Australia. Wildlife Research Bulletin no. 11. Department of Fisheries and Wildlife, Perth. ^ Burbidge, A. A., N. L. McKenzie, and K.F. Kenneally. 1991. Nature conservation reserves in the Kimberley, Western Australia. Department of Conservation and Land Management, Perth. ^ McKenzie, N. L., R. B. Johnston, and P. G. Kendrick. editors. 1991. Kimberley rainforests of Australia. Surrey Beatty & Sons, Sydney. ^ Wheeler, J.R. editor. 1992. Flora of the Kimberley region. Department of Conservation and Land Management, Perth. ^ Kenneally, K. F., D. C. Edinger, and T. Willing 1996. Broome and beyond. Plants and people of the Dampier Peninsula, Kimberley, Western Australia. Department of Conservation and Land Management, Perth. ^ Price, O., D. Milne, G. Connors, B. Harwood, J. Woinarski, and M. Butler. 2001. A conservation plan for the Daly Basin bioregion. Parks and Wildlife Commission of the Northern Territory, Darwin. ^ "Kimberly tropical savanna". Terrestrial Ecoregions. World Wildlife Fund. ^ Beolens, Bo; Watkins, Michael; Grayson, Michael (2011). The Eponym Dictionary of Reptiles. Baltimore: Johns Hopkins University Press. xiii + 296 pp. ISBN 978-1-4214-0135-5. ("Kimberley", p. 141). ^ Lane, J., R. Jaensch, and R. Lynch. 1996. Western Australia. Pages 759-943 in A directory of important wetlands in Australia. Australian Nature Conservation Agency, Canberra, Australia. ^ "Inquiry into the 2011 Kimberley Ultramarathon". Economics and Industry Standing Committee, Western Australian Legislative Assembly. August 2012. Report No. 13. Archived from the original on 2 February 2017. Retrieved 22 January 2017. ^ "Music Icons Unite Over JPP Fight - Save The Kimberley". www.savethekimberley.com. Archived from the original on 23 March 2016. Retrieved 28 April 2018. ^ a b "Economic Activity". Kimberley Development Commission. Government of Western Australia. Archived from the original on 13 August 2014. Retrieved 12 August 2014. Wikimedia Commons has media related to Kimberley, Western Australia.